In the current News there is info on the Prickly Pear wagon semi-sprung suspension systems. Has anybody tried them and with what results? I have a set to try under a SECR van but haven't got around to it yet. Hoping to try them in a week or two. They're very clever. They allow you to have springing (of a sort) without having to fettle out a channel in the rear of the axleboxes. I think they'll be a big hit. They allow you to have springing (of a sort) without having to fettle out a channel in the rear of the axleboxes. just like the original P4/Studiolith version, of couse, instead of the channel in the back of the axlebox you have to arrange detached springs, as for rocking W-irons but at both ends of the wagon. I think that with these units the gap needed between (say) axleboxes and springs will be very small, as both can move. I prefer this arrangement to 'rocking springs'. I tend to think of this system as "soft" compensation. I have some to try (no time yet) but the proprietor of London Road Models is quite impressed. I've got an 5 plank open wagon on which I tried having two pivoting W irons connected to each other and the body by a spring, a variant of the Prickly Pear system. It worked Ok in as far as the wagon ran reliably, but the body (well weighted below floor level) wasn't held stable by the spring, being inclined to oscillate form side to side. I suspect the Prickly Pear version will be much less inclined to do this than mine, due to the way I did it, but I'd worry that it could still happen. I definitely wouldn't consider one of these under a heavy white metal van as I would expect a strong tendency to lean one way or the other. I produced this as part of trial of a variety of wagon suspension. This was 5 otherwise identical wagons with 5 different suspensions. I.e. The result was that they all ran OK on the track available (Knutsford reception sidings) until shunted through pointwork at mark 1, at which time the sprung versions eventually showed their superiority. The double pivot/sprung wagon was voted worst, because of the way the body wobbled about. In terms of fitting the various suspension systems I found it simpler to slot the back of the axle boxes to suit the sprung solutions than to arrange a disconnection between the axle box/spring/sole bar to suit a rocking W iron. Ealing wrote: They allow you to have springing (of a sort) without having to fettle out a channel in the rear of the axleboxes. There is no need to 'fettle a channel' in axleboxes used with sprung suspensions. All that is needed is to used waisted bearings and give the hole in the axlebox a small countersink. Will L wrote: I've got an 5 plank open wagon on which I tried having two pivoting W irons connected to each other and the body by a spring, a variant of the Prickly Pear system. It worked Ok in as far as the wagon ran reliably, but the body (well weighted below floor level) wasn't held stable by the spring, being inclined to oscillate form side to side. I suspect the Prickly Pear version will be much less inclined to do this than mine, due to the way I did it, but I'd worry that it could still happen. I definitely wouldn't consider one of these under a heavy white metal van as I would expect a strong tendency to lean one way or the other. in thinking further about the PP system I am inclined to think it might be okay with plastic bodied wagons, but heavy w/m vehicles (especially vans), with a high CofG might be more inclined to suffer from wobble. I won't get around to using the PP etches I have for some time (other priorities in my modelling diary) so would be interested of any other experiences. Being one of the computer-less few I don’t usually see what’s appearing on these new-fangled website thingies but the comments on my PPP W-irons were brought to my attention and, I felt, deserved a reply. I was pleased that most of the comments were favourable but Will Litchfield’s mention of a bit of a wobble on heavy cast whitemetal vans was concerning and at that point in time I had a classic example, a GNSR cattle wagon, under construction. Much to my annoyance there is a bit of a wobble that sets in at one point in particular over a baseboard joint where the track was not at 90º to the joint and the rail level fell on one side and then on the other in fairly quick succession. It has to be said that the track over this joint could do with a bit of adjustment – both rails drop a little bit, one by a mere 0.03mm but the other by an undesirable 0.125mm and it was hitting this drop first and then the smaller one that set off the problem. The magnitude of the wobble was related to speed – too slow or too fast reduced the tendency for a wobble to be initiated and whether the vehicle was being pulled or pushed also had an influence – on the latter a wobble was less likely presumably as the resistance from the bufferheads on the adjoining vehicles tended to reduce the likelihood of a wobble starting off. Far closer scrutiny however, with my nose right up close to the wagon, showed there was also a hint of ‘Will’s wobble’ on a plain rail joint, where one length of rail was just butted up to the next, and possibly another one in an area of pointwork but I couldn’t really get my beak close enough to see that one for certain. Grumble-groan, something had to be done! Despite trying various dodges I haven’t been able to come up with a solution I’m totally happy with. The current fix is to put chocks under one of the W-irons to convert it to a fixed unit (for which some 1mm thick plastic strip is a good starting point) while leaving the other end as semi-sprung. Thanks should go to the Peter Swift and Philip Hall camp for this suggestion. Further experimentation suggests that, as Jol Wilkinson intimated, the problem largely comes about due to the high centre of gravity of the vehicle – a Slater’s PO wagon weighted with lead sheet on the upturned plastic floor puts the centre of gravity at about 18mm above rail level and works fine. My cattle wagon has a centre of gravity about 25mm above rail level and has a problem! I’d have thought it’s general practice to keep the centre of gravity as low as possible when building rolling stock anyway, and as long as the centre of gravity stays below about 20mm above rail level I’d reckon things should be fine and for most plastic and etched brass kits this shouldn’t really be a problem. For vehicles with a higher centre of gravity if ‘Will’s wobble’ is a problem there seems little option at present (unless you know better) but to make one of the W-iron units fixed and leaving the other one semi-sprung – this still gives a better ride than a conventionally compensated vehicle in my opinion. Paul, you shouldn't beat yourself up about this. I've built a few plastic open wagons using the PP system now, and I've seen lots more similar vehicles running - all have worked well. No sign of "Will's wobble". Also you should be praised for your pioneering spirit, it's innovative people like you that keep the hobby moving forward. Having spent time having to explain why it was vehicles with CSBs or sprung axles boxes tend not to wobble on their springs, it was always inevitable I would have taken an interest in the Prickly Pear springing system, such things being close to my heart. In fact I would have been happy to have been proved wrong, as I think that might be preferable to being remember for "Wills Wobble". I thought several times before posting before, as I think there is little place here for knocking copy, and I have thought on since over the dynamics of the situation. I've come to the conclusion that there is a working balance that must be to be struck between the weight of the wagon and the strength(i.e. thickness) of the spring wire. This is obviously so when the vehicle weight is carried entirely on the springs, but is less immediately obvious when the weight is primarily transmitted through the w iron pivots. So considering the Prickly Pear system, if the spring wire was too thick the suspension wouldn't work and the vehicle might as well be rigid, while if the spring is too thin it will not prevent the wagon flopping to one side or the other. The question is, can there be middle point when suspension movement is sufficient without losing the stability of the body. The answer seems to be yes, given that for many wagons the system works and "Wills Wobble" is only an issue on heavy wagons, the solution for them may just be thicker springs. Paul Tasker has been experimenting, and has asked me to post the following on his behalf. Following on from my previous comments in early July about the problem of cast whitemetal vans having a bit of a wobble when using my PPP W-irons I’ve now managed to come up with a solution that I’m happy with. The basic fix worked by making one W-iron far more rigid than the other one but not to the point where it is fixed and rigid – the spring wires are left in place and still operate. This is done using a thin packaging material somewhat similar to bubble-wrap but a lot thinner and when looked at close up it looks a bit like crazy paving – it’s often found wrapped round electrical items like shavers, CD players, etc. Jiffy produce some under the name of Astrofoam which comes in three different thicknesses (0.7mm, 1mm and 1.2mm) although doubtless there are other producers while mine came round a Braun shaver so presumably it’s of Germanic origin. The gap between the wagon floor and the top of the W-iron unit is about 1.2mm so I cut two small rectangles of my 1mm thick foam and at one end of the wagon pushed the foam between the floor and the W-iron unit and then added a little strip of 0.25mm thick Evergreen strip against the W-iron unit to make up the height to about 1.2mm. I haven’t glued these bits in place yet as they seemed to stay put on their own and I was worried about solvents upsetting the foam, but I will probably secure them with a few little spots of varnish in the corners in due course. The test vehicle, in this case a LSWR sliding door van, now doesn’t wobble and is a lot more stable across its width. On the down side having one end more fixed than the other still meant there was a slightly more noticeable lurch at the more rigid end although it wasn’t as obvious as on a compensated vehicle. The improved fix then developed by pottering off down a further avenue of exploration that presented itself - I put foam in at both ends to give a sort of multiple-airbag suspension system. This works fine as well and as one end is not more rigid than the other there isn’t the ‘more noticeable lurch at one end’ phenomenon. This is now the suggested means of overcoming the wobble problem. As a bit of an aside, I also had a brief trial with foam pushed under the pivoted W-iron of a couple of compensated wagons but the results seemed to be mainly detrimental so I didn’t proceed too far with this. I've just put one of these suspensions together and I'm having trouble getting the buffer height right. 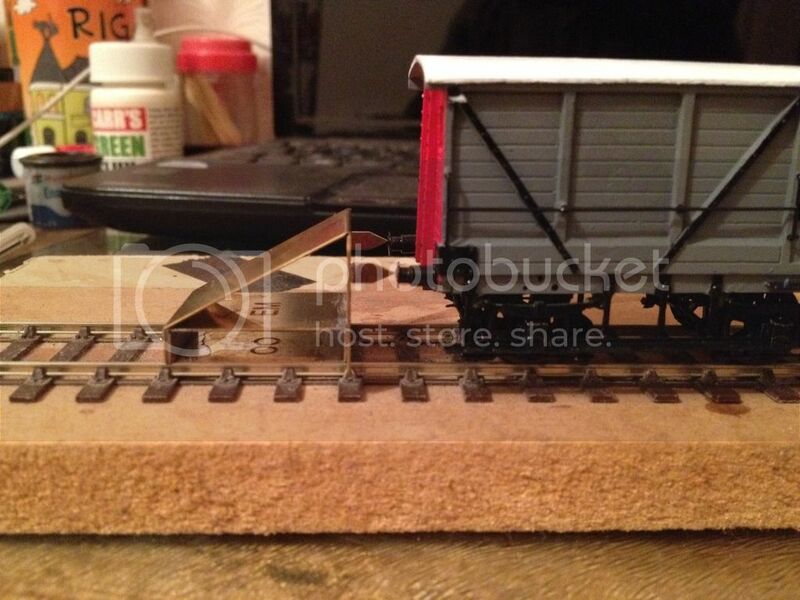 The rocking plates are soldered to a brass sheet about 0.4mm thick and that sheet rests against the wagon floor. The floor is fixed on top of the headstocks. The wheels are Gibsons 12mm. The buffer height comes out about 0.75mm too high without any packing. Is there some extra fettling I was supposed to do to sort the ride height? Guy, on the wagon I built with this system there is a gap between the floor and the W iron units, but with yours there seems to be none. Maybe the floor is very thick? I will try and have a word with Paul Tasker to see if he has come up against this problem before. I'm not sure if this will help with your ride height problem, Guy, but here's a copy of the information leaflet Paul Tasker had on his stand at Scaleforum. This is the assembly I made up last night. The brass to which the rocking bases are soldered is actually 0.25mm, not 0.4 as I'd guessed. ... and this is the result. Maybe the vehicles previously tested with PP parts were all vans? PS: I measured the wheels: they are 12.4mm over treads at the root of the flange. An Exactoscale wheel measured 12.5mm in the same place. The wheels look like 3'1" or thereabouts, but the rocking W irons look as if they're meant for 3'6" wheels. I've had a word with Paul Tasker (who does not have computer access, which is why I'm replying on his behalf) and his initial comment was that the suspension units are not intended to be mounted on a baseplate but direct to the wagon floor. The demonstration units on his stand are soldered to brass sheet for illustration purposes only. Although your brass sheet is very thin it could make a difference if it is not completely flat, and also perhaps there might be a thickness to the glue used to secure the sheet to the floor. Or possibly if, at this stage, the floor is merely resting on the brass sheet there might be a gap somewhere. The W irons are designed for 3'1" wheels so it can't be that causing the problem. Could you say, please, what make of kit you are using, because Paul has said that he will have a further look at this and get back to me for a further posting. Hope this helps. Here's my result from using these w-irons. I did attach them to nickel silver sheet, but it is at floor height. The kit is, I think, by POWsides, but I'm not completely certain. It's been in tupperware with other work in progress and I discarded the box a while ago. The rolling chassis has not been glued in, so glue thickness is not yet an issue. I did my buffer-height test with the body pressed onto the rolling chassis by finger pressure, so I'm fairly sure that there were no air gaps. I compared the PP axleguards with Bill Bedford ones. The PP axleguards are definitely taller, and the extra height is in the section where the outer legs of the 'W' are angled; i.e. in the part intended to be below the solebars. Thus, I think that even if removed my metalwork the axleguards would still not fit this wagon. Also, if the BB design is a close match to the RCH spec (1907 spec for this wagon, IIUC), then the PP design is clearly less good a match; it is probably based on some other prototype. Mr. Watcher's wagon will get BB axleguards and I will keep my PP assembly for when I need to build a van with pre-RCH fittings. I think the LBSCR had some vehicles with narrower axleguards.